searching for daffodils | Pondering life, death, and their inevitable intersections. FamilyLife Today (R) is a syndicated radio program hosted by Dennis Rainey. Today’s episode was a rerun of a broadcast that originally aired several years ago, an interview that Dennis conducted with Hall of Fame college basketball coach John Wooden. The “Wizard of Westwood,” Coach Wooden was known for his integrity, for the numerous national championships his UCLA teams won, and for being a teacher of both sport and life. How much difficulty might be lessened or eliminated if we treated every person in our lives as if they’d just handed us the same note? The controlling in-law who always has suggestions? The obstinate co-worker who makes your job harder? The unsaved neighbor who bashes Christianity at every opportunity? I Corinthians 13 is commonly referred to as “the love chapter;” its verses are often recited at weddings and utilized in premarital counseling. The synopsis of those chapters – and Mrs. Wooden’s note – is this: without love, our thoughts and actions don’t matter. You’re bound to have heard it said before, people don’t care how much you know until they know how much you care. In other words, “If I don’t know that you love me – or if I know that you don’t – then I’m not interested in anything you have to say to me.” We relate to that easily when others presume to speak into our lives with motives that are dubious or uncertain. But, it becomes a foreign notion to us when we know exactly what someone should do but they refuse to heed our obviously wise counsel. Why won’t they listen to us? Is it because they are just too proud and stubborn? Could it be, perhaps, that you haven’t earned the right to be heard and heeded because you haven’t truly shown the person that you love him or her? Andy, what does all of this have to do with grief anyway? I’m glad you asked! We all know someone or three who grieves in ways that we don’t understand. They are stuck in the mire of sadness and depression, and they seem to want to stay stuck there. They find ways to direct EVERY conversation back to the person they mourn, even months (or years) later. Maybe the opposite is true, maybe you don’t think they are affected enough or they get over it too quickly. Here’s some advice that will help you, and it just might help you help them: don’t try to understand them, just love them. When you love someone hard enough for long enough, you might just discover that your need to understand them goes away. “If I have a faith that can move mountains, but do not have love, I am nothing” (I Corinthians 13:2b, NIV). It’s so much easier giving advice than taking it. I’m a genius in dealing with everybody else’s problems and an idiot in my own life. At least admitting I have a problem is the first step. Yesterday was a milestone day in my grief journey, the one-year mark since my mom left this life. A few friends sent messages of encouragement, letting me know they were thinking about me and praying for me. There was such a sweetness in the mix, none of them specifically mentioned why they were thinking about me and praying for me but we all knew the unspoken reason. By itself, there’s nothing magical about the one year-anniversary of any event. When it comes to something especially sad, though, there’s a subtle psychological force that’s always there. Some days that force lingers in the background and some days it’s front and center all day, but it’s there. Even when it’s not affecting you heavily, that force is a constant reminder of “firsts”: the first holiday without that person, my first birthday when he/she wasn’t here, etc. When I speak to people who are struggling with certain traumatic issues, sometimes I point to that first anniversary in trying to encourage them to reclaim territories of their lives that grief and sadness have invaded. I just didn’t know how well I’d be able to implement my own advice. I can usually gauge my own reactions a few days in advance. I knew two full weeks before that Christmas would be a struggle for me, and it was. At the time I predicted that the one-year anniversary wouldn’t impact me as heavily, and it didn’t. I could tell a few days ago that I would be “okay.” I’d thought about crafting a message on my mom’s Facebook page yesterday, but I wasn’t compelled to do that (and there were already good messages left there by others). I considered picking a little bouquet of daffodils and sticking them in a glass jar to place on her head stone, but the best of this year’s daffodils are behind us. I didn’t need to “get away,” I just stuck with the routine of living life. 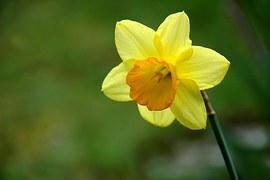 In that normal living of life, God sent a nice bunch of daffodils. When you work with students in a church setting most of them view you with the attitude of “eh, whatever;” their personal feelings will wax or wane like the moon depending on the circumstances of the week. On one extreme end of the spectrum are the students and parents who generally regard you with disdain. On the other extreme end are the ones who love you personally, passionately, and unconditionally. It was on that end of the spectrum where I found daffodils yesterday. One of those “in your corner” students in my previous ministry was a sprite of a young lady named Riley. Riley’s passion is dancing, and for five or six years she has been involved with an artistic company whose primary focus is putting on an evangelistic/worship production over the two weekends prior to Easter. About 100 middle & high school dancers will practice for months to put together almost 30 numbers, and they’ll do eight fast-paced shows in a 500-seat auditorium with every show being over 95% capacity (most will be sold out). The production quality is high, the ability of the dancers is strong, the creativity is unique, and the purpose unifying those traits is unrivaled. Riley’s parents offered me tickets, and I jumped at the chance to take them for one reason – I’d get to see Riley in her spotlight. She’s not the most accomplished of those 100 dancers (she is great, though! ), but she’s the reason I wanted to be there. I knew from experience that I would enjoy my time, but I wouldn’t have cared about the experience except for the little thing with flowing brown hair and a smile that beams. I thought that was my daffodil. And it was. It just so happened there was a bouquet waiting to surprise me. On stage for the finale, Riley saw my little group in the auditorium. There were plenty of other folks who she knew there, but you could tell her awareness of our presence sparked her. When the crowd was dismissed, I told my family we weren’t moving until we got a chance to speak to her. The tiny dancer navigated her way through the swarm of too many people jostling for position in the aisles and she walked past more than a few of those familiar faces to come to me first. She gave me the tightest hug that said – without actually saying it – “You were here for ME!” Yes, yes we were. Neither a sixteen year-old girl nor her parents understood their therapeutic roles in my life yesterday. After writing last week – twice – about the time to mourn and the time to dance, I entertained the thought of writing about “the time to watch other people dance.” The dancing was irrelevant, though. What mattered was the reminder that there are people who love me for no other reason except they love me. In spite of my mistakes and even though there’s not much I can offer them in any practical way, they love me. A year ago at that same time, I was accepting that there was no medical intervention to preserve my mom’s life. What could have been a somber and oppressive day was actually the opposite. On the way home I was reminded of Matthew 5:4, “Blessed are those who mourn, for they will be comforted” (NIV). The selfless act of a mom & dad and the genuine appreciation of a high school junior had NOTHING to do directly with my emotional circumstances, but they were a comfort of extreme proportions. I can see my mom’s headstone from my house, but I don’t visit her grave frequently. Yesterday after returning home, I did just that. I didn’t stay very long, but long enough to smile at the bunch of daffodils blooming on my grandmother’s grave a few feet away and long enough to thank God for the wonderful people – including my mom – He’s put in my life. Even when we don’t want it to, life goes on. Let yourself find comfort in the people who love you. Let yourself be comfort by loving the people in your life. When you do that, you’ll enjoy a whole lot more daffodils beside the road of life’s journey.